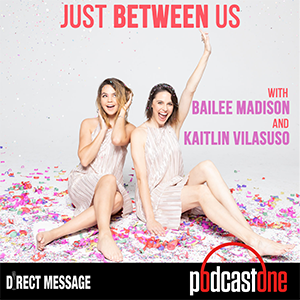 On this week's episode of Just Between Us with Bailee Madison and Kaitlin Vilasuso , the girls welcome their significant others to the studio. Actor and social media influencer, Alex Lange , and Young and the Restless hunk, Jordi Vilasuso, shared their stories of love, challenges, and opinions on mani-pedis - but not before finding out how much they really know about their significant others. Just Between Us is produced in partnership with PodcastOne and The Direct Message, and executive produced by Crystal Fambrini and John Ryan, Jr . (Co-Founders of The Direct Message). This week's episode is sponsored by FabFitFun! Go to www.FabFitFun.com and use code "JBU" for $10 off your first box! Sisters Bailee Madison & Kaitlin Vilasuso explore strategies on career and life success. First they welcome The Intern Queen Lauren Berger, a career expert, author and keynote speaker on how to score that coveted internship, fellowship and/or apprenticeship. And for those of us out of school and well into our careers, they also talk on how you can continue to refine and define success. Then we bring on a real world expert, lawyer Katie Markeson, from Markeson Law Firm. Katie shares what it was like to be a judicial intern and gives some success secrets on how to excel in law. PLUS, all four get into a roundtable discussion about Kim Kardashian's announcement that she is studying to take The State Bar of California to become a lawyer in 2022. Just Between Us is produced in partnership with PodcastOne and The Direct Message, with executive producers Crystal Fambrini and John Ryan, Jr. (Co-Founders of The Direct Message).